Last week, 44 African nations came together and signed the Continental Free Trade Agreement (CFTA). Under the continent-wide agreement, nations commit to cut tariffs on 90 percent of goods with the aim of increasing intra-Africa trade. The historic document creates the largest free trade zone since the creation of the WTO in 1995. Still, 11 African nations have yet to sign the agreement, including South Africa (for technical reasons) and Nigeria. Representatives from the Nigerian government state that the agreement would undermine local businesses, hence the country’s decision to abstain from signing the agreement. This post looks at the state of intra-African trade and contrasts it with the evolution of trade with partners outside of Africa. Africa’s intraregional trade lies well below that of other regions. In 2016, intra-African exports made up 18 percent of total exports, compared to 59 and 69 percent for intra-Asia and intra-Europe exports, respectively. The figures for imports are similar. There have been slight improvements in the past 10 years, though, as the share of African countries’ exports within the continent have slightly increased. The share of imports, on the other hand, have remained stagnant, despite the increase in total import volume. On a different note, Foresight Africa 2018 looked at the change in Africa’s trading partners in the past 10 years. Over the past decade, sub-Saharan African trade has slowly trended away from developed countries and toward emerging economies. In fact, since 2006, the region’s exports to the United States and the European Union have declined by 66 and 5 percent, respectively. For comparison, exports to India, Indonesia, and Russia have more than doubled, as have imports from these three countries and Turkey. 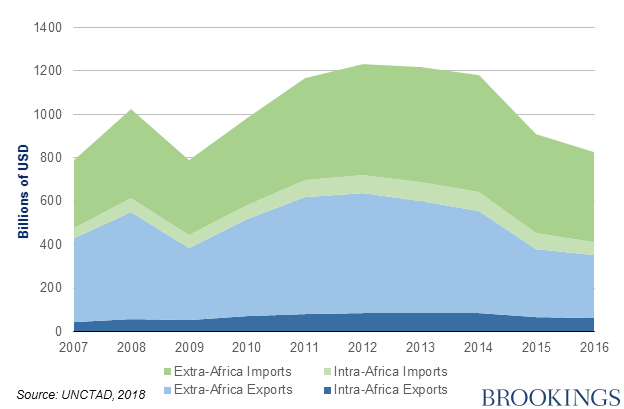 While the share of total exports to traditional trading partners (the EU, U.S., and China) remain considerably higher than that of new partners, this progression paints a new picture for the future of African trade. 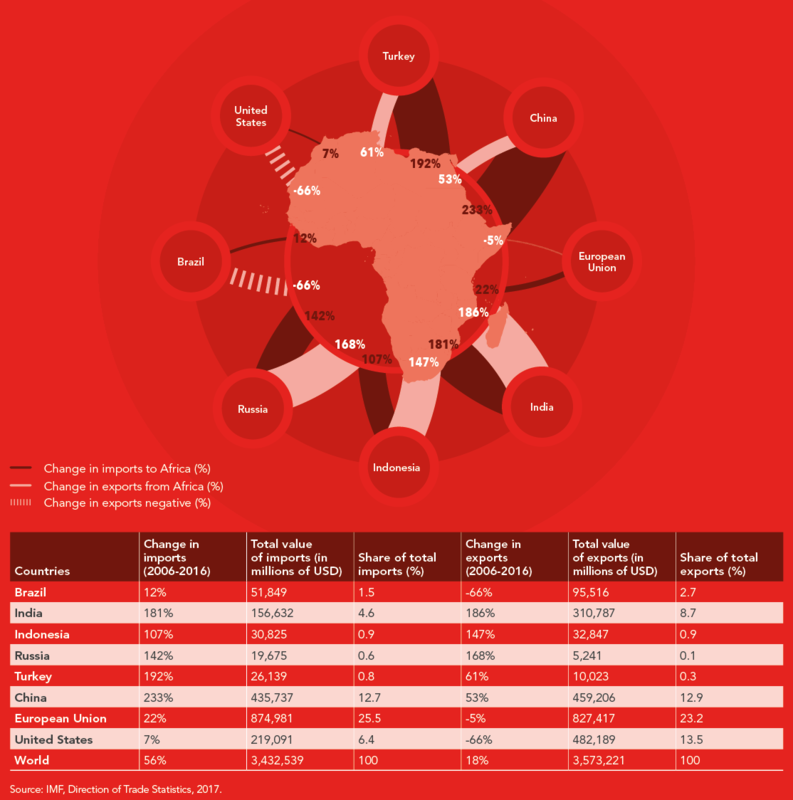 The landscape of Africa’s trade destination has been shifting in recent years. The continent has been moving away from trading with developed regions (e.g., the European Union and the United States), and toward trading with emerging nations. Strengthening regional value chains: What’s the role of the African Continental Free Trade Agreement?